Cook pasta shells as directed on package. Drain. Rinse with cold water to cool; drain well. Meanwhile, in 5 to 6-quart Dutch oven, break up ground beef. Add bell peppers and onions; sprinkle with salt. Cook over medium-high heat until beef is thoroughly cooked, stirring frequently. Drain. Stir in pesto, mozzarella cheese and beans. 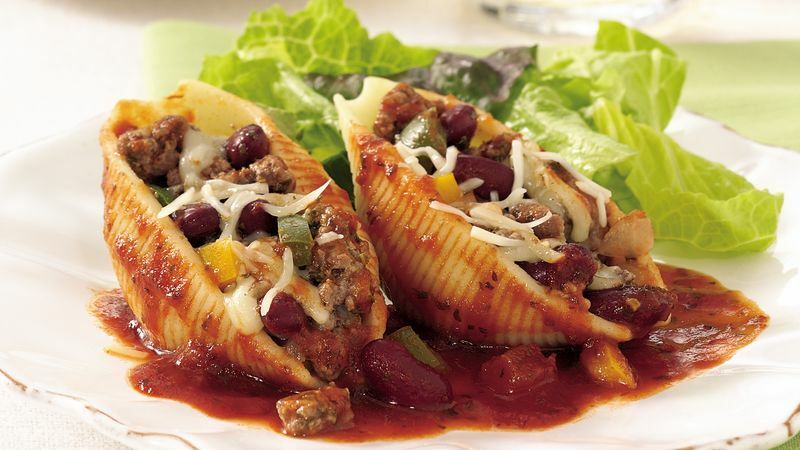 Fill each cooked pasta shell with scant 1/4 cup beef mixture. Place 12 filled shells in each of 4 large (9 1/2-cup) rectangular freezer/microwave-safe containers. Spoon 1/2 jar (about 1 1/2 cups) of the pasta sauce over each to cover. Sprinkle each with 1/4 cup Parmesan cheese. Cover; refrigerate up to 3 days or freeze up to 2 months. Thaw 1 container of stuffed shells in refrigerator for 24 hours, or uncover and thaw in microwave on Defrost for 15 to 20 minutes. If one family member likes the beans and the other doesn’t, just use 1 can in half of the mixture and leave the other half without. Freeze the finished dish in a microwave-safe glass or plastic container. Then you’ll be able to quickly thaw and heat directly in the microwave. Inexpensive microwave-safe plastic containers are available in most discount and grocery stores. The large rectangles that hold 9 1/2 cups are perfect for this recipe.